There are a ton of things I love about living in Colorado, but one of my favorites is definitely being able to go skiing / snowboarding whenever we want! [Michael does both ski and snowboard, and I just snowboard!]. I’ve posted a few pics / videos of us on the mountain on instagram, and I’ve gotten SO many questions about what to wear for snowboarding. 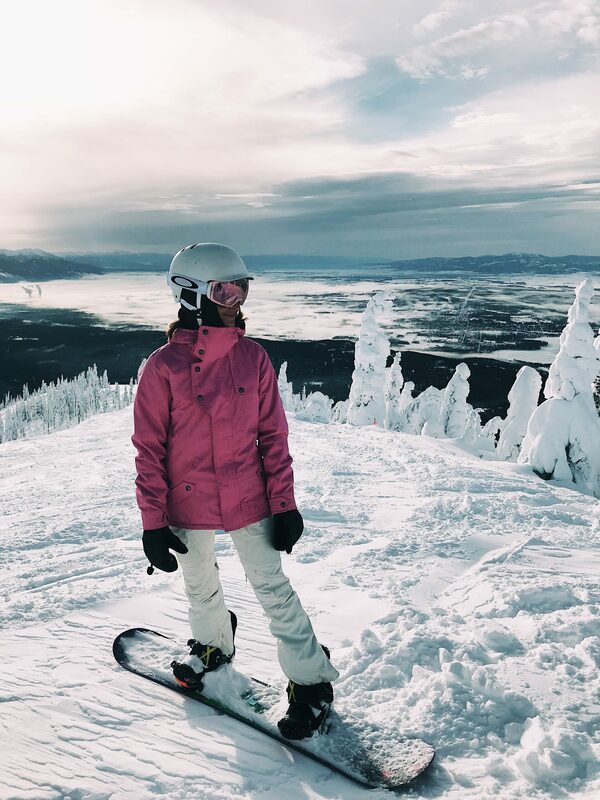 So, today I’m going to share with y’all head to toe what I wear when I snowboard! First of all – a helmet is 100% necessary. I used to think only beginners needed a helmet, or people who were doing crazy jumps and going through trees. But, no. EVERYONE needs a helmet. Even if you’re doing a super easy run, anyone can have a random fall that can be extremely dangerous. SO, if you ski/snowboard all the time, I’d recommend buying this one. I have this one by Oakley that I love. If you’re just going on a random trip here and there, you can rent a helmet from the same place you’ll rent your board and boots. Goggles are also super important. There’s nothing worse than not being able to see clearly when you’re on the slopes. I have this Oakley pair and really like them! Now onto the clothes. I tend to LOVE Burton for my snowboarding gear. I think it’s cute, fits great, and has amazing quality + technology for skiing and snowboarding [as far as warmth and waterproof goes!]. My jacket above is Burton but it’s several years old. It’s very similar to this Burton jacket which I actually just ordered in blue! It has a slim fit [I mean, for a snowboarding jacket] and it’s so warm without being too bulky! I love it! My snowboarding pants are also Burton. They come in tons of colors and they’re super warm and comfortable. Now for what goes UNDER the jacket and pants. Personally, I am a major baby when it comes to cold weather so I like alot of layers haha. Michael just wears one layer though. So everyone is different. I wear these tights under my snowboarding pants and also love this patagonia pair. Up top, I’ll usually wear some type of under armor base layer with this patagonia pullover over that. If it’s CRAZY cold, sometimes I will add a patagonia puffer / down vest over that. But, typically I just wear those two layers under my jacket. Hope this helps any of y’all that are heading on a ski trip soon! Let me know if you have any questions below! OR if you have any “must-haves” for skiing / snowboarding, share those in the comments below! Thanks for reading! 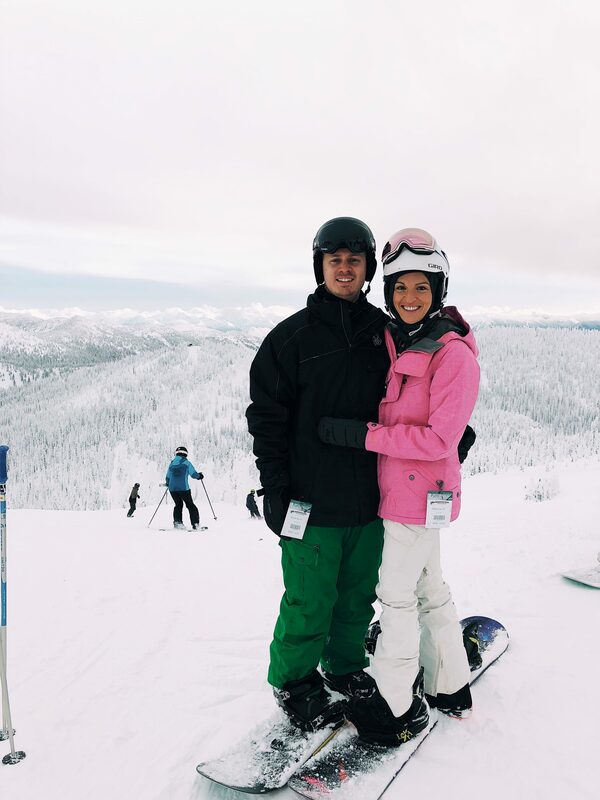 Love reading your top picks for hitting the slopes! 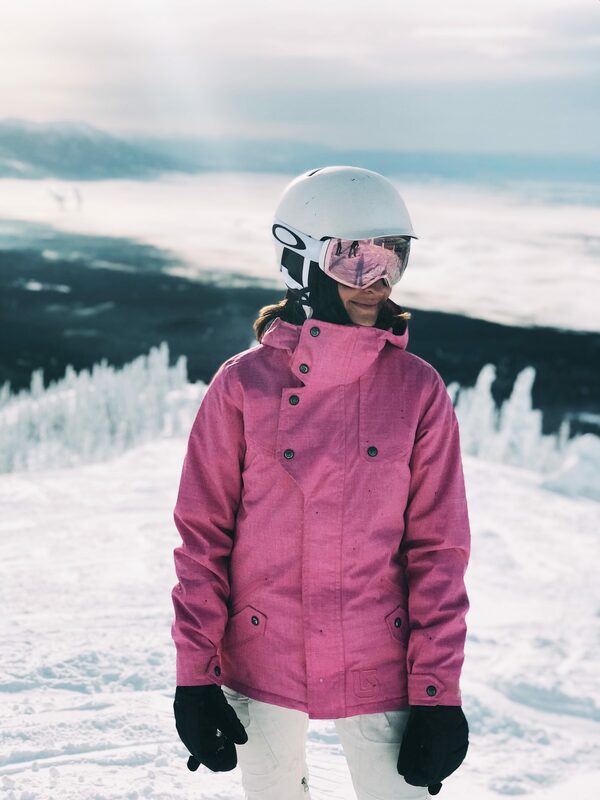 I am in serious need of new gear – literally have the same ski coat from high school 10 YEARS AGO (granted I only wear it like 2 times a year sadly). Looking forward to traveling to Denver/Keystone/Boulder in December and trying some real slopes (I know I plan way in advance hah)! What size do you wear in the jacket?